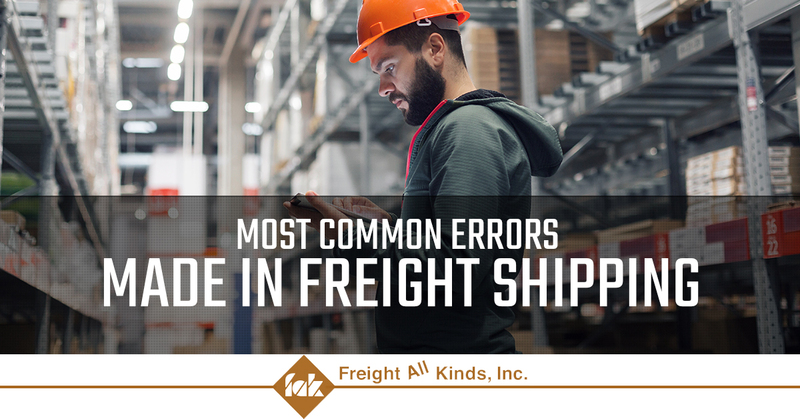 Just like in any other industry, freight shipping comes with its fair share of common mistakes that are made by both small and large companies. Though some of these errors may seem small, they can oftentimes cost the shipping company quite a bit of money. The worst part about these errors is that they’re easily fixable or could’ve been caught before they were problems. In this blog, the expert freight management company, Freight All Kinds, will show you some of the most common mistakes made in freight shipping. These mistakes are all easily mendible, so don’t worry if you notice that you commit one or more of these errors. So, without further delay, let’s dive into the most common errors made in freight shipping. We’ve all shipped a package with little to no packaging, believing that the contents will be able to hold up to the common bumps and bruises associated with shipment, only to have those items arrive in pieces. Proper packaging will help mitigate damage to your package or shipped items, which will make both you and your customer happy. Be sure to use enough bubble wrap, packing peanuts, or other packaging materials you use in shipping to ensure that your package arrives in tact. Broken or damaged products will always call for refunds or reissues, which will cost your company time and money and will most likely lead to bad reviews, which in this day and age can be one of the worst things to happen to a company. In shipping, having the right address is probably the most important aspect of the job. Not only does this dictate where the shipment will go, it decides the route your carrier will take to get there. If your carrier has the wrong address, and can’t get ahold of anyone to get the right one, then not only do you have to pay for double the transportation costs, but you may have to pay a fee for not showing up to a delivery. If the client still wants your products, then you’ll have to redo the delivery, hopefully having the correct shipping address this time around. Errors like this may not be detrimental, but they can cost you big time on resources like gas, vehicle maintenance, and driver costs. reclassification fees on the same route. Most of the time we just sign the receipt without much thought about the consequences that it may bring. If you do this with freight shipment, then you may be losing a lot of money very soon. A receipt without notes says that the shipment was received without any damage, which is a great thing. But if there was any damage done during the shipping process, then you may be the one who has to foot the bill for the costs if you sign the receipt without inspecting your newly received shipment. The old saying “Trust but verify”, is a smart code to live by when dealing with freight shipping. Loyalty is a great thing to have when it comes to business, but in terms of freight shipping, it could cost you quite a bit. When you rely on only one carrier to get all of your shipments where they need to be, big complications can arise. For instance, if you enter a contract with a single carrier and your freight needs change, then you could possibly be in financial trouble as you may not be able to alter the contract you agreed upon earlier. The carrier could also downsize, which is bad for those with larger order or needs, or they could become too big for your business, which would negatively impact smaller companies. In freight shipping, depending on just one carrier could possibly be detrimental to your business. At Freight All Kinds, we hope you’ve found this blog to be helpful. If you’re looking for the best freight management company in the United States, then FAK is right for you. We can help you keep track of your shipping with comprehensive reports, manage all of your shipping needs, and even find the perfect carriers for your business. Learn more about Freight All Kinds, request a free quote for your company, or contact FAK today to answer any questions about our company or services.